Office furniture doesn’t always need to be used in an office. With a little bit of elbow grease and innovation, you can transform used and tired office furniture into personality-filled functional furniture for your home. After some time spent browsing, we found these 10 examples noteworthy. Remember these card catalogs? Due to the huge advances in technology, there are few and far between Dewey Decimal classics to be found at current libraries. 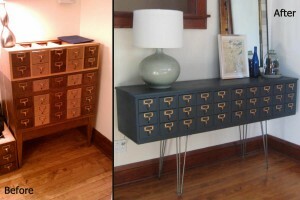 This do-it-yourselfer took it upon herself to take a used card catalog and turn it into a beautiful credenza. The original piece was cut in half and screwed together to add width. A new top and base was made and attached to the frame. After some paint and the addition of hairpin bases, this is a completely functional and beautiful storage credenza! For more details on this project, visit her blog. We have quite a few used cap tain’s chairs in our warehouse desperately looking for a new home, which is why seeing this used chair brought back to life thrilled us. White paint and some new fun upholstery makes it look like a brand new piece of furniture. The silver nail-heads add quite a bit of pizzazz as well! 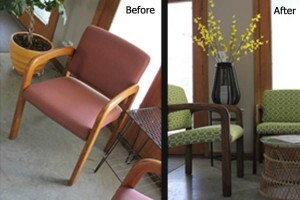 To see the step-by-step process on how this chair was refinished, click HERE. One thing that people typically want to add to their kitchens is an island. This DIY-er took a used desk and transformed it into a gorgeous mobile island. The hutch was removed from the desk and shortened to be the same height as the desk. Attach these two pieces to each other for depth and add a shelf where the knee space would typically be, and it starts to look like an island. A base was added for detail. 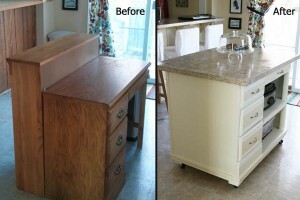 After some caulk, paint, casters, and a countertop – a beautiful kitchen island is made. Adding some matching hardware for the rest of the kitchen makes this once a used-desk now a kitchen beauty seem like it was always there. Click HERE for the original posting on this masterpiece. This project transformed a us ed 2-drawer file cabinet was painted and put on casters (two that lock for security) to make a striking kitchen cart. Some fresh paint, and additions of two horizontal towel racks and a Caesarstone top make this office essential a kitchen necessity. 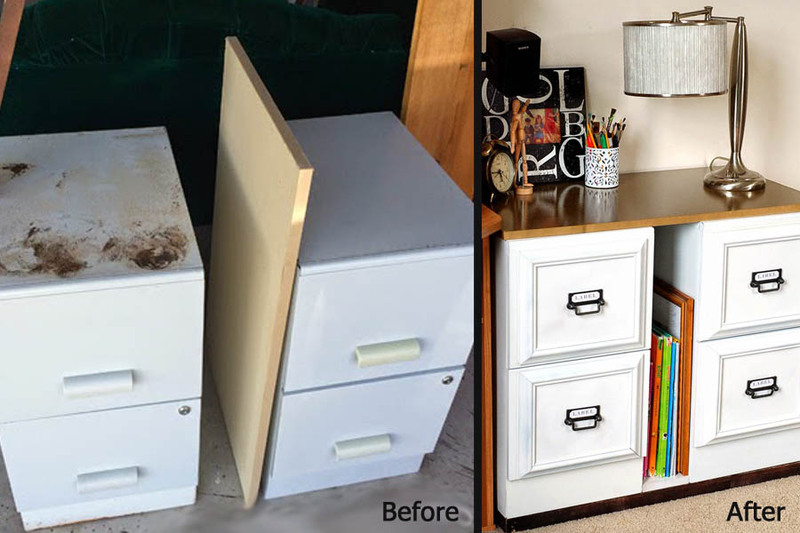 Adding more used filing cabinets gives more versatility and adds an extra workspace, as static or mobile storage, if that is something your home lacks. While we don't have a before picture here to show you, THIS blog post gives you all you need to know to complete this project yourself. 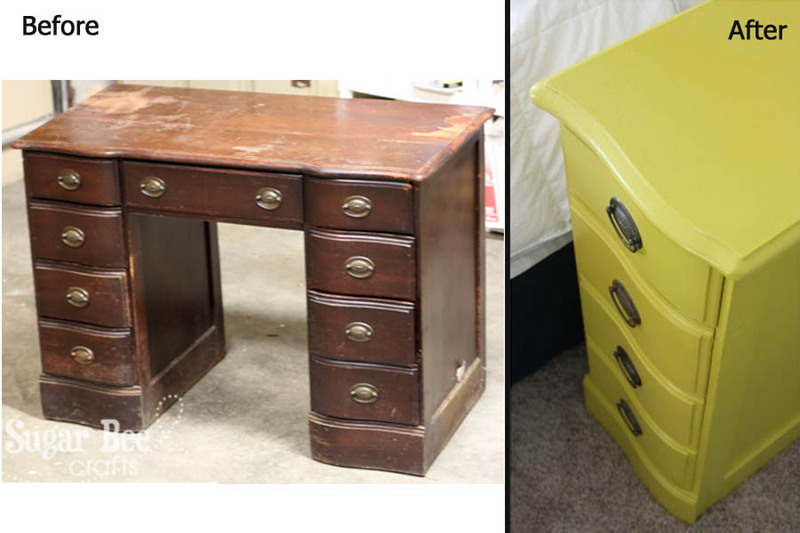 A used double pedestal desk is great for making matching nightstands! Break free each pedestal from the top and either replace the top, or re-edge the side that was cut. A fresh coat of paint and new pulls and voila! Two bold and matching nightstands for a steal! THIS blog post gives you her step-by-step process. Filing cabinets are rarely pretty in a residential setting. 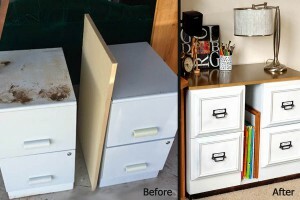 This do-it-yourselfer took it upon herself to upcycle used vertical filing cabinets by adding a couple picture frames to look like molding and painting everything white. 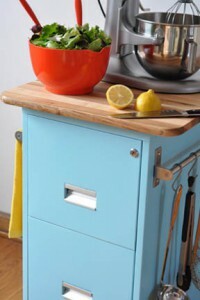 Adding handles, a top and base made this office essential look much more like a store-bought home storage piece. We love how this turned out. Click HERE for the original blog post. We are all familiar with the standard office guest chairs. We’ve either seen them in waiting rooms or a private office. Because of their simple but sturdy structure, these used chairs can easily be given a new life. The frames can easily be unassembled for sanding and staining. 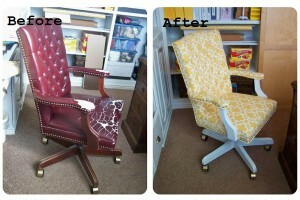 A fresh upholstery to go with gives these traditional office guest chairs an updated look. The blog this used chair refinish was posted on has since been taken down. Regardless, we were so impressed with the outcome, we couldn't NOT post it. Turn a used desk or credenza into a unique bathroom vanity cabinet. The existing drawers provide ample storage for toiletries and other supplies. 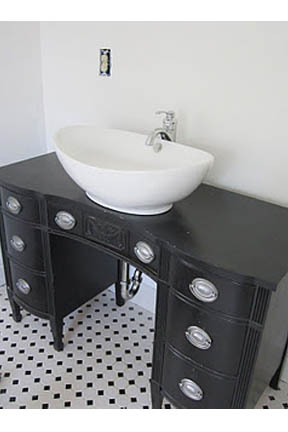 This may take a little more handiwork as you will need to plan for plumbing, but application of paint and a vessel sink turn a tired used office piece into a fresh personality-filled vanity. Again, we don't have a before picture of this creative repurpose, but the original blog post can be found HERE. 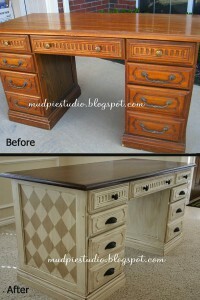 Sometimes one of the best things you can do to a used desk is to keep its function but give it a facelift. A distressed paint job with dark top and new cup pulls give this desk a beautiful vintage look. What really makes this striking is the diamond pattern on the side panels. Click HERE to see the transition. Feeling inspired to make your own re-purposed piece? We’re a great resource to help you find used desks, chairs, file cabinets and more for your own project! Browse our used inventory HERE. Already create a used office furniture transformation? We would love to see it!